Here we show the diagramming of a crime scene where the only remaining evidence is a single photograph or video frame. Using PhotoModeler, and its various tools designed for this sort of project, important measurements can be extracted long after the scene is gone. In this simulated crime scene project, a single image from a surveillance camera was used. The parameters of this camera are not known so we used the Inverse Camera process in PhotoModeler. Using assumptions of parallel and perpendicular lines we set up Constraints applied to the marked lines (as shown in the first image). When the project was solved, the camera parameters (such as its position, its angles, and its focal length ) were solved along with the positions of the lines in 3D space. Additional detail was then added to the model using Surfaces and Surface Draw . After adding scale to the model, it was ready for measurement and for export to a diagramming package such as Crimezone for further enhancement. 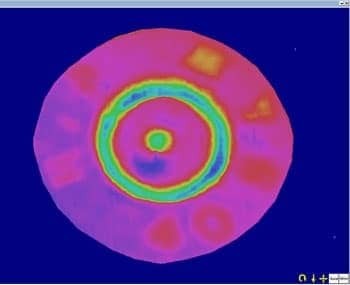 While this project was based on an unknown camera and a scene from the past, this method can also be used as a quick way for a forensic technician or officer to diagram a scene where they were present to take the photograph with their own camera. Determining bullet trajectories is an inherently 3D process. 3D photogrammetry provides a powerful capability to compute trajectories and determine source points (courtesy of DCM Technical Services). The image shows a car door with rods placed in the bullet holes. The rods have RAD targets placed on them to help automate the process. 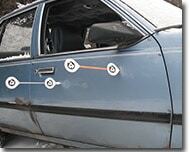 Other RAD targets would be placed around the car so a known 3D coordinate system with the bullet vectors can be reconstructed. These rods are available for sale here. 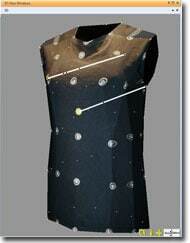 A novel technique described in this short article takes a piece of clothing from a victim's body to help map out stains, and bullet trajectories. Traditionally this is done in 2D by laying the garment out on a table, but here it can be modeling in 3D using PhotoModeler and then demonstrated to the court using animation and other 3D techniques. Image courtesy of AI2-3D Forensics. The PhotoModeler Scanner product is capable of producing dense 3D point grids and surfaces from photos of subjects with texture. Two interesting applications are the 3d surface capture of foot prints and tire tracks in sand and soft soil. Similarly the shoes and tires can also be scanned so you have a 3d model of both the imprint and the imprinter. The image at right shows a 3D point cloud of a shoe print in sand - done with a few photographs and PM Scanner. The top color rendering is done by another package to show depths by color (images courtesy of AI2-3D Forensics). The image at left (courtesy of AI2-3D Forensics) shows a rendering of 3D shoe surface (different shoe than above) with triangle grid overlaid. The small inset shows a blow up of one section. This illustrates that you can obtain accurate 3D models of both the imprint (shoe in sand), and imprinter (shoe) quickly and easily with PhotoModeler Scanner. An animated 'fly-by' of the rendered 3D shoe surface can be seen below. The location and shapes of fluid spatter on surfaces can be important to determine the source of that spatter. While there are some accepted techniques for doing this spatter analysis, we propose that a 3D capture of the locations and shapes, or at least a 2D ortho-rectified image of the surface may assist with such analysis. This would be especially true if there were multiple surfaces at different angles and positions involved. This shows (courtesy of AI2-3D Forensics) two projects created in PhotoModeler showing the extracted surfaces with photos projected back on. This gives an excellent vehicle for studying the positions and shapes of the spatter long after the scene is gone. 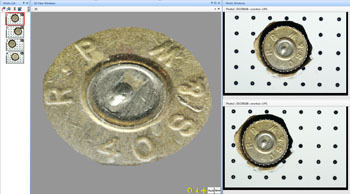 This Scanner project shows the dense 3d scan of the rim of a bullet cartridge using just the texture of the metal. This is a macro project (close-up done with a Sony A200 and Minolta 50mm macro lens). 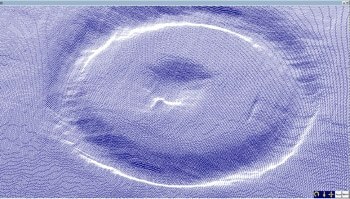 This demonstrates that Scanner can work with very small objects (less than a cm across here). This project was completed by Eugene Liscio of AI2-3D Forensics. The top screen shot shows two of the photos (cartridge surrounded by target dots to get accurate camera orientation), and a 3d view of the 3d textured rim model. The middle screen shot shows a close up of the center pin fire region as 3d dots. The last screen shot shows the dense surface points (that were extracted by PhotoModeler Scanner) colorized in the 3d view by height to show the surface variations and show the pin fire location.